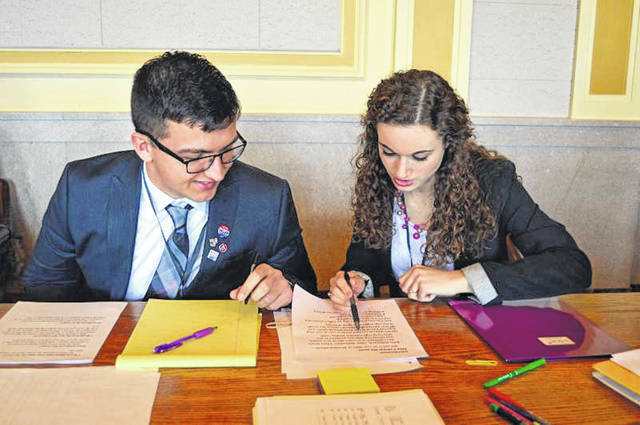 Students from South Webster High School prepare their case during last year’s competition. COLUMBUS – More than 3,000 high school students will enter courtrooms across the state on January 18, to take part in the Ohio Center for Law-Related Education’s (OCLRE) 36th Annual Ohio Mock Trial Competition. Locally, the District Mock Trial Competition is coordinated by Sharee Price of the South Central Ohio ESC and Judge Howard H. Harcha, III. There will be 11 high school teams from 8 school districts participating in the competition this year including: Notre Dame, Portsmouth, Portsmouth West, River Valley, South Webster, St. Joseph Ironton, Valley and Wheelersburg. Local sponsors include: Velma Feagans, Howard H. Harcha, III, American Legion James Dickey Post #23, Portsmouth Bar Association, Portsmouth Rotary Club, Scioto Foundation and SOMC. The 2019 Ohio Mock Trial case focuses on Fourth Amendment protection against unreasonable searches and seizures as it applies to technology. Fictional defendant Quinn Woolf is charged with aggravated theft and telecommunications fraud for allegedly using a private, alpha-numeric code to steal $120 million from the state pension fund. The catch is, the state used an aerial drone to obtain images of the defendant in the Woolf’s backyard. Each Ohio Mock Trial team consists of five to eleven students who assume the roles of witnesses and attorneys to present both sides of an original, unscripted case based on a constitutional issue. Each team competes in two trials against opposing teams. More than 1,000 legal professionals serve as volunteer judges, competition coordinators, and team advisors. Ohio Mock Trial is Ohio’s largest high school academic competition and among the largest high school mock trial programs in the nation. The Ohio Mock Trial District Competition is hosted in 26 counties throughout Ohio. Teams that advance from the District Competition will compete in the Regional Competition on February 15. Regional winners will compete in the State Competition on March 7-9 in Columbus. The 2019 state champion team will represent Ohio at the National High School Mock Trial Championship in Athens, Georgia, May 16-18. OCLRE is a non-profit, nonpartisan organization whose mission is to improve society by developing citizens empowered with an understanding of our democratic system. OCLRE is sponsored by the Supreme Court of Ohio, Ohio Attorney General, Ohio State Bar Association and the American Civil Liberties Union of Ohio Foundation. The Ohio Mock Trial program is made possible, in part, by a grant from the Ohio State Bar Foundation.